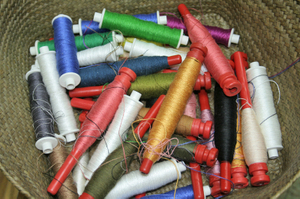 Shuttles and bobbins and pirns, oh my! For the last day of the year, a look back at the mess some weavers get into when they don't unwind old bobbins & pirns at the conclusion of a project. I spent yesterday afternoon gathering these goodies from all corners of the studio. The ones with "good" yarn, such as handspun or other precious bits, I carefully rewound into balls and put away for next time. 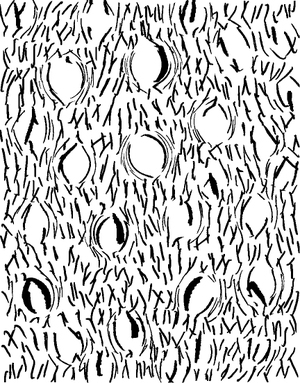 But the rest of this stuff, mostly 10/2 cottons & rayons, I wound together, four ends at a time, into three balls. When one bobbin ran out, I tied on another, with no regard to color. Just a random collation. 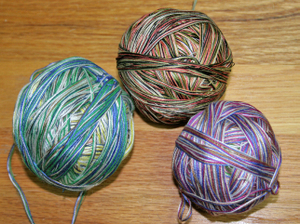 At the end I had three big balls of amalgamated yarn ready for knitting or whatever. Now all my bobbins & pirns are bare and I feel so much better. I'm ready to start the new year. I'll bet you thought I was going to discuss my New Year's resolution to lose ten pounds? Wrong! This is about one of my favorite Photoshop filters. It's the filter called Liquify, and within this filter the tool called Bloat. In this particular example I did a black and white drawing of random lines on a white background, applied the bloat tool to get the bubble areas, then thresholded it to reduce it to black and white. It's now ready to have the black & white separated out into layers, and the weaves applied. Or use this file as a layer in another drawing. 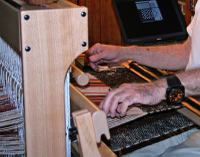 At a recent weavers' conference, Bruce was attracted to a Louet Octado loom in the vendors area, and said he thought he'd like to have that loom, and learn to weave. It shouldn't have been a surprise - after all, he's been watching me weave for the past 43 years, and has been a general weaver's assistant for most of that time. Fast forward a few months. The loom arrived, was assembled, and then the fun began. Erik gave us an old laptop, we installed software, and eventually got the loom up and running. We have an interesting arrangement: I do all the designing and warping (this is the part of weaving that I really love). Bruce does all the weaving on the Octado, mostly while he's listening to music on his stereo. He was a fast learner. His third warp was a set of white tencel aviator scarves to replace the beloved silk scarf that he wore to shreds. His weaving technique is steadily improving, and he now has an even beat and very tidy selvedges. The current warp is for a blanket, a wool warp set up in birdseye twill on 8 shafts. The weft is a border Leicester wool I spun 2-ply from the fleece our son and daughter-in-law gave us from their flock of a few years back. This is a gorgeous wool, glossy & nearly black, and we have a ton of it! It's so great that Bruce is weaving now, and we will finally have a way to use this wonderful stash. When he's finished with the 10-yard warp we'll cut it apart into 3 lengths, sew them together (baseball stitch), and there's our blanket. The biggest challenge in weaving gifts like this is in finding a willing friend or family member to supply the photograph. I was lucky - Alan emailed me half a dozen digital photos of the happy couple, and I chose my favorite. 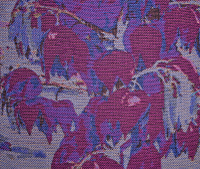 I then tweaked the file in Photoshop, added a more interesting background, reduced it to 5 colors, put each color on its own layer, applied weave structures as layer styles, sent the file to my TC-1, and wove the file in lampas structure. 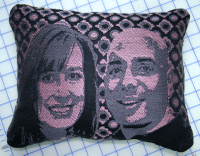 The wedding's in another month - I hope they like this pillow. In my ongoing struggle with an out-of-control stash of handwoven fabric, I'm thinking of making it all into tote bags to sell (or, as we like to call them around here, Toad Bags). This stash is really obscene, like HUGE, and contains a few pieces that are yards long, and many scraps as small as a few inches. Some of this stuff is beautiful, some ho-hum, and some downright ugly, but I can't bring myself to throw any of it away. I ask you, could a mother throw away her own children? 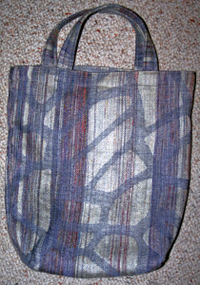 Here is prototype bag #1, a jacquard-woven piece with gray polyester warp and handspun wool weft. 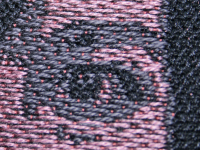 In the picture the weft is running vertically. Lining is commercial fabric. In future bags, I will probably collage smaller pieces to make up the needed size. Finished bag 13" x 16", plus handles. Belle, a samitum project, was cut off the loom today. She is a bit of a hybrid, as the warp was originally set up for lampas, and every third warp end is peach colored silk, which is intentionally hidden within the fabric. Only the black warps show. OK, maybe the peach shows through a teeny bit, but let's just ignore it. As always, click on any image to see a bigger version. A really big surprise is that the reverse side looks even better. There is something very pleasing about the colors, even though the values are a bit askew. Here is a new project based on a digital photo. I've interpreted it in Samitum structure, using the presets in Chapter 9 of The Woven Pixel. 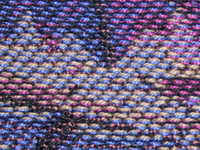 The specific presets I used are a 4-weft samitum in 1/2 twill, with a ratio of 2/1 in tie-downs to Inner warps, and the preset numbers for those of you with the book are 036 through 040. 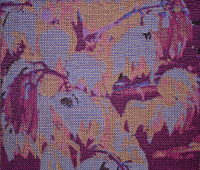 The first picture is of the work in progress, on the loom. Click the thumbnail for a larger view. The second picture is a detail. More pictures to come! This morning while walking at Furman, I saw this mushroom and thought it would be a good starting point for a palette. de8639, a44518, c86d33, f0cb7f, b47d35, 783714, 985220, 301b0f. I also used these 8 colors in a small drawing and saved the color table, so that I may use it for future projects.